Today the Hotdogman became the Fishing man. Every summer, my dad, my son and myself charter a boat and go do some deep sea fishing. Last summer we had the BEST FISHING TRIP EVER with Captain Pete Midurski on the good ship Margaret and Stephanie. Nothing breeds success like repetition, so we opted to go fishing with Pete again this summer. This time even Mrs. Hotdogman managed to tag along! It was a gorgeous summer Sunday in Fairhaven Harbor. 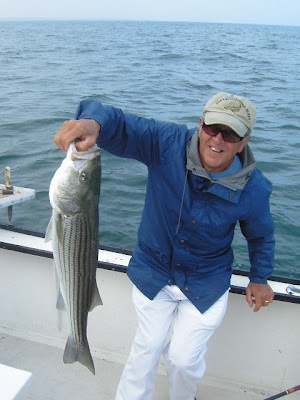 We made our way over to Martha's Vineyard and fished off a ledge near Squibnocket. The Captain had tempered our expectations stating the fishing hadn't been very good this summer. We were going to fish with chunk poagies-just like last year. Needless to say the Hotdogman landed the first fish of the day on the first cast of the day-a nice keeper bluefish! 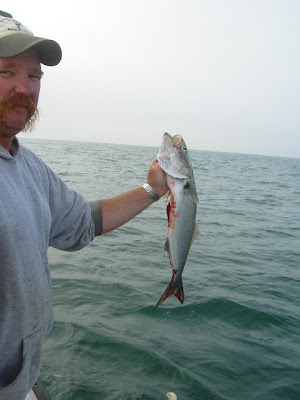 Here's Captain Pete with the freshly gutted bluefish. Unfortunately, Capt. Pete had slippery fingers and dropped the fish overboard right after the picture was taken. I mercilessly teased him about this faux pas for the entire day, of course. Lucky for us, there were more bluefish out there. The good news is the good Captain's doom and gloom predictions did not come true. 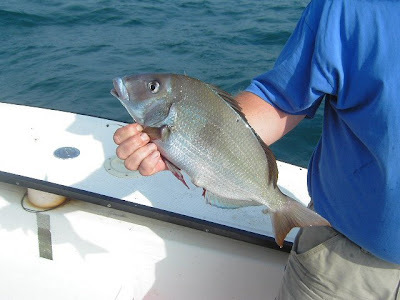 We had an EXCELLENT DAY catching about 8 bluefish, a couple dozen striped bass, half a dozen fluke and a very big scup (we catch lots of scup off the docks, but I have never caught one this big-he was DELICIOUS). 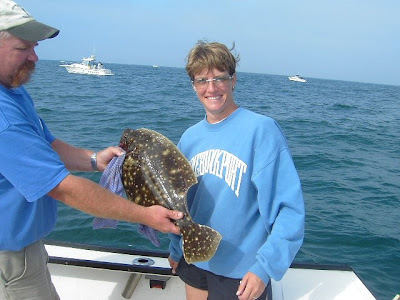 Here's Mrs. HDM with the big fluke she hauled in. Here's one of the stripers. I think we'll be giving Capt. Pete a call next summer-I should have finished eating all the fish by then! 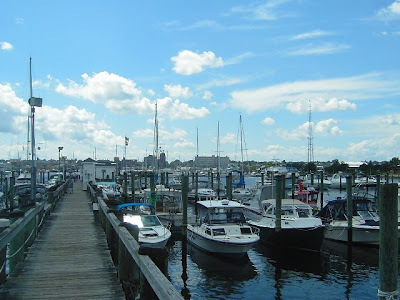 If you want a good chartered fishing trip in the Southeastern, MA area- give Capt. Pete a call at 774-353-7683. Just make sure he hangs on to your fish!